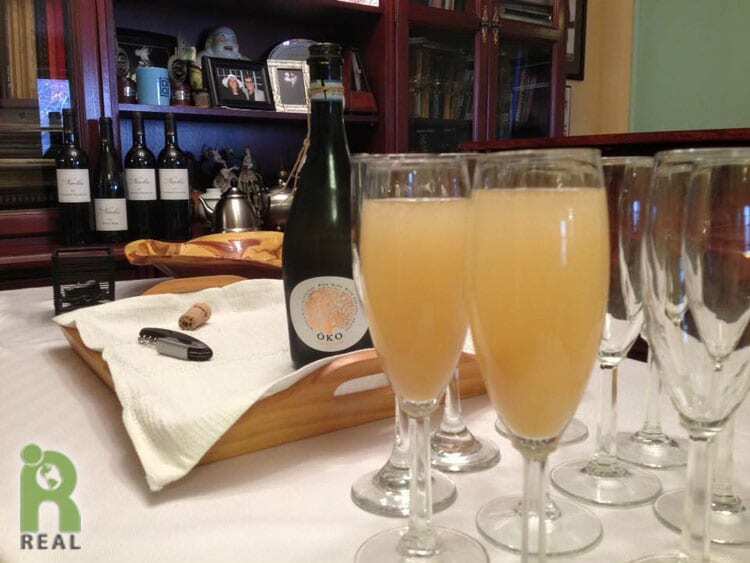 The Bellini, one of Italy’s most famous cocktails, is made ​​with sparkling white wine (Prosecco) and pureed white peaches (succo di pesca). If peach puree is not available try pear or another fruit nectar. The drink became a seasonal specialty at Harry’s Bar, an institution since 1931 and a favorite of Ernest Hemingway, Sinclair Lewis, Alfred Hitchcock, and Orson Welles. It later became popular in New York, after a French entrepreneur established a means for transporting white peach puree between Venice and New York. Add a heaping tablespoon of the puree mixture to the bottom of a champagne flute. Slowly pour in the Prosecco. Tip: Although you can substitute other Italian sparkling white wines such as Asti Spumante Brut for the Prosecco, don’t use champagne as its flavor is not a good match for the sweet peach juice.